Champion combo tatami mats are great for those who combine cardio, striking arts and grappling. This mat is manufactured using the same technology as our offical IJF Approved Tatami. The Champion combo mat is 1" thick (2.5cm) made of high density foam that offers a firm surface and excellent shock-absorbing capacity. Covered in tatami-style textured vinyl and futures an anti-skid "waffle" bottom for stability. Tournament Mats On Sale..... click here !! Top quality materials and superior workmanship guarantee years of use. 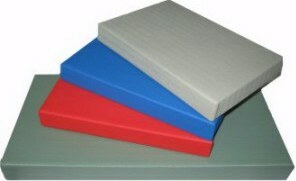 High density polyurethane foam, durable, super resilient, fully sealed corners and ruber waffle anti-slip bottom is permanently attached. *Ask us about volume discounts.